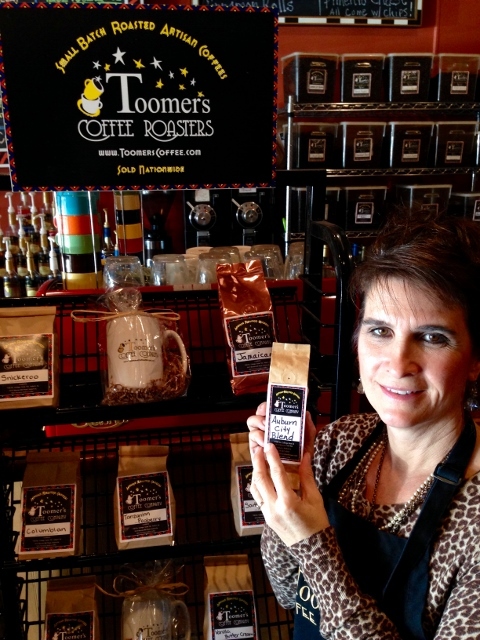 Golden Globes gift bags to include Toomer’s Coffee Company’s ‘Auburn City Blend’? The folks at Toomer’s Coffee Company will likely be tuning in intently to the Golden Globe Awards Sunday night, but not to see which movies will win. Even if we didn’t already know, who cares — the important thing is that more than 60 gift bags given to whomever gift bags are given to at the Golden Globes will contain the two ounce bags of coffee roasted in Auburn and sold at Toomer’s Coffee Company. At least that’s what the Toomer’s folks are saying. Because, hey, that’s what they were told. “We were very excited about it,” says owner Toni Holt. Exactly what it is, though, is hard to say. Here’s what we know: A guy came into the coffee company’s South College street shop a few weeks back, before Christmas. He wanted to buy coffee that was locally roasted. He wanted some Auburn coffee, and he wanted a lot of it–66 bags, the two ounce size. He didn’t say a lot about why he wanted them; the folks behind the counter thought they heard something about a movie premiere. When they called back to confirm the order, he said, no, it wasn’t a movie premiere: It was the Golden Globes. The coffee would be going in gift bags handed out at the Golden Globes. So who was this mystery man? Justin… his name was Justin. Toni Holt, co-owner of Toomer’s Coffee Company in Auburn, holds up bags of their Auburn City Blend, which may soon be fueling the careers of Hollywood A-listers. Holt and Co. gave him the Auburn City Blend (made from three varieties of Arabica beans). Why Toomer’s Coffee? Why not Toomer’s Coffee? The beans are sold here, they’re roasted here–and by a man, Sandy Toomer, the shop’s original owner, with a very, very, very Auburny last name (they’re quick to say they’re the coffee, not the Corner, but surely they share a grandfather with the distant drugstore cousins somewhere down the line). So hey, War Eagle — win for Auburn, Toomer’s Coffee, caffeine of Dixieland. “It’s kind of fun,” Holt says. Related: A ‘War Eagle’ on Oscar’s red carpet.